This Butterfly Glow Viz-A-Ball makes the perfect gift for a beginner bowler or someone who likes to bowl for fun! Fly down the lanes in style with this butterfly ball that glows under blacklight! Speaking on my daughter's behalf, "This is a great spare ball and looks beautiful going down the lane." I took some lessons and learned how to hook my main ball too well. So well that when if I left the 10 pin even going across alley my ball would still do a little flip at the end. So it was time for a spare ball. I decided I wanted something a little different since in the higher end balls you don't get a choice of the color. So I decided on the vis a ball. When I saw the purple and the butterflies I knew I had to have. 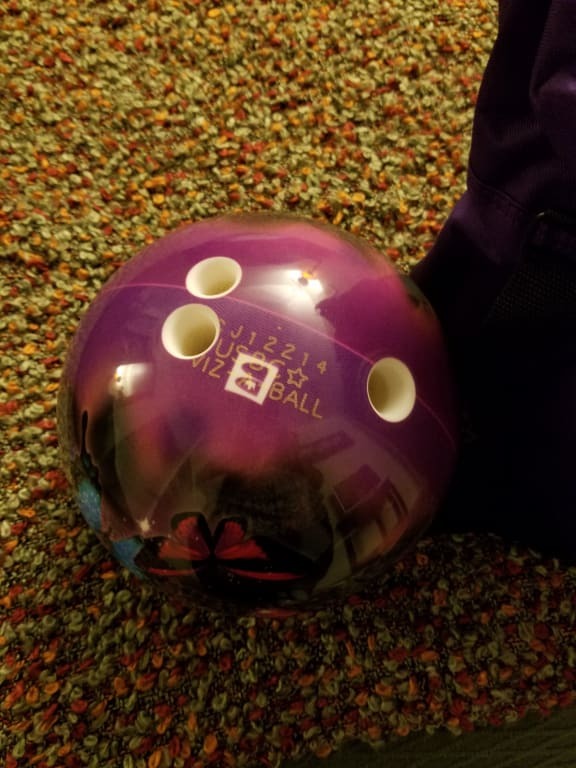 It has helped me with my nemesis the dreaded 10 pin and everyone who sees it loves it. I received this ball as a gift from my sister. I am a beginner beginner bowler - just started a month ago and never bowled ever before. I am in my mid fifties and love this ball. When I started bowling, I could only knock down about 60 pins in a game. But within a month, and with a couple lessons at the local bowling alley, I am now putting down over a hundred pins each game. Love my ball. And other ladies at the alley have been asking at the pro shop where they could get one. This is an unusually beautiful ball. Everyone comments on it! It's my granddaughters birthday present so she will try it on her birthday in a couple weeks. Unfortunately this ball does not come in 11 lbs. is 6 the lowest weight for all bowling balls or do allys have lower weight for children? Hello Bobbi! The lightest weight that balls are usually made in is 6 pounds. I don't know of anyone who makes them smaller than that. Does this ball glow in the dark? Hello! The ball doesn't glow in the dark. It glows under black light. 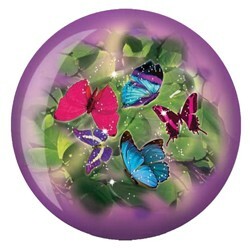 Is the butterfly bowling ball - can you se the butterflies even if it's not in black light? Hello! Yes you can. The black light just makes everything pop a little bit more. They will both be on the ball. Yes, you can take it to your pro shop to have it cleaned. how much weight is lost from drilling the finger holes? About 2-3oz are taken out after drilling. 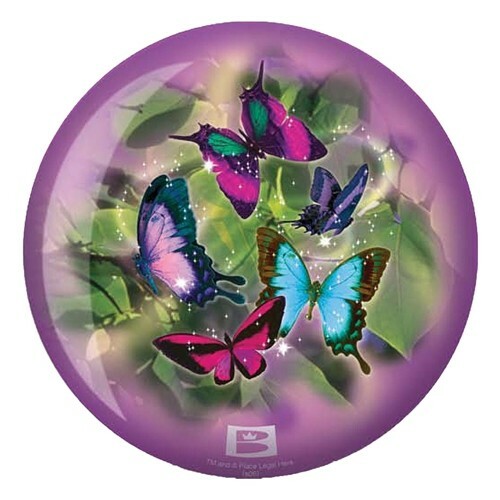 Due to the time it takes to produce the Brunswick Butterflies Glow Viz-a-Ball ball it will ship in immediately. We cannot ship this ball outside the United States.